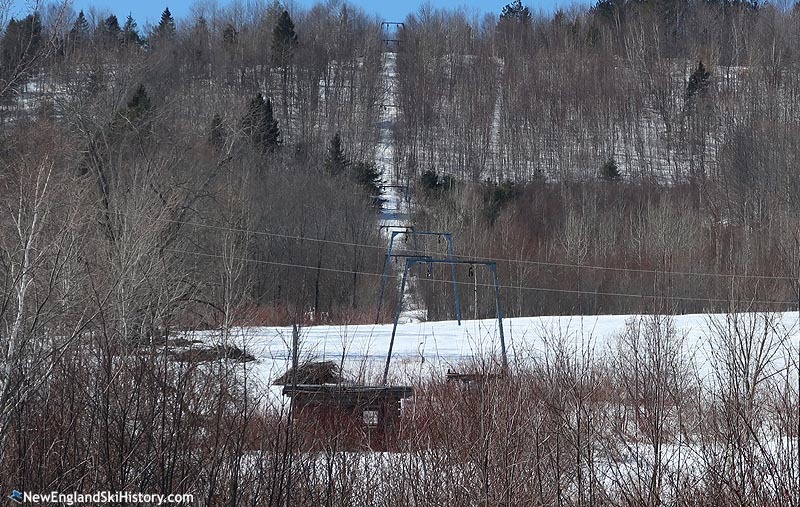 Located on 1,025 foot Robinson Mountain in northeastern Maine, May Mountain ski area operated as a surface lift facility for about a quarter of a century. Downhill skiing on May Mountain possibly dates back to 1962-63, when Dr. William L. Daniels, Dr. Hiram Stevens, and Jacob Shur developed a small ski area on May Farm. A decorated World War II combat medic, Dr. Daniels was both a ski instructor and a member of the National Ski Patrol. An osteopath like Dr. Daniels, Dr. Stevens resided in nearby Smyrna Mills. Shur, owner of the land, was a farmer and entreprenuer who later had a research center at the University of Maine named after him. Their ski area organization likely became known as the Katahdin Valley Outing Club. As a prelude to expansion, on October 30, 1968 the Katahdin Valley Outing Club entered into a 45 year lease with Shur for $500 per year or 7.5% of gross receipts, pending the attainment of financing. The lease would be nullified if the area failed to operate in three consecutive winters. At the time of the signing, Dale Greenlaw was President of the non-profit club. On November 20, 1968, the Katahdin Valley Outing Club obtained an $85,000 Farmers Home Administration loan for the development of the ski area. A 2,210 foot long by 428 foot vertical Alpine Lift T-Bar was installed, instantly making the area one of the largest in Northern Maine. By the time 1970 arrived, May Mountain was advertising 7 trails and 2 slopes, served by its T-Bar. The Katahdin Valley Outing Club led the 100th anniversary celebration of Island Falls in 1972, with the events kicking off with a dinner and torchlight parade at the ski area on February 26. In late 1977, presumably due to financial issues, the Farmers Home Administration released Katahdin Valley Outing Club from its loan. Landowner Jacob Shur transferred the ski area's lease to an entity called The May Mountain Area, led by President Edwin Degenhardt. Owner of multiple McDonald's franchises in eastern Maine, Degenhardt and his wife were known for their charitable work. Jacob Shur passed away in 1980, which also happened to be a bad winter. Around this time, May Mountain was reportedly being operated by a local high school ski club. The ski area reportedly ceased operations in 1982. In 1984, May Mountain Area agreed to terminate its option to purchase the land from the Shur family. In April of 1987, May Mountain Area agreed to terminate its lease of the land. In conjunction, May Mountain Area transferred the ski area assets to Vacationland Estates, Inc., possibly in exchange for two timeshares at the nearby resort. Vacationland Estates fromed a subsidiary named Vacationland Ski to run the area. $100,000 was invested in overhauling the lift, renovating the clubhouse, clearing the overgrown trails, and purchasing a Pisten Bully snow cat. For the 1987-88 season, May Mountain featured seven trails, as well as night skiing on the main trail adjacent to the liftline, Jacob's Ladder. While the installation of snowmaking was considered, the new ownership decided it wasn't worth the investment at the time. The ski area may have been sold as soon as the 1988-89 season and may have changed hands multiple times around the turn of the decade. May Mountain Ski Association was formed before the start of the 1992-93 season and may have operated the area for a short time. 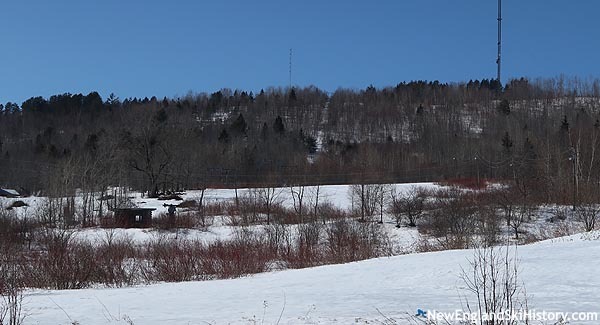 It is not known when May Mountain closed, but according to the New England Lost Ski Areas Project, the area last operated in the mid 1990s. As of 2017, portions of the lower slopes remain clear, however the majority of the ski area has grown in. The T-Bar remains standing. There are no known plans to reopen the ski area.